Società Sportiva Calcio Napoli, commonly referred to as Napoli (pronounced [ˈnaːpoli]), is an Italian professional football club based in Naples, Campania that plays in Serie A, the top flight of Italian football. The club have won two league titles, five Coppa Italias, two Supercoppa Italiana titles, and one UEFA Cup. Formed in 1926, the club saw relatively little success in its early years, winning one Coppa Italia until 1965, where they were refounded. Napoli then saw increased success in the 1980s, after the club acquired Diego Maradona. During his time in Naples, Maradona helped the team win several trophies, which led to the club retiring his number 10 jersey. Following his departure, however, Napoli struggled financially, and endured several relegations, prior to being refounded in 2004 by film producer Aurelio De Laurentiis. Under his guise, the club has stabilized, which has led to renewed on-field success. By attendance, Napoli have the fourth biggest fanbase in Italy, and were ranked as the fifth highest-earning football club in Serie A, with $182 million in revenue during the 2017–18 season. In 2018, Forbes estimated the club is the fifth most valuable club in Italy, worth $379 million. Napoli are also one of the associate members of the European Club Association. Since 1959, the club has played their home games at Stadio San Paolo, and have traditionally worn sky blue shirts and white shorts. The club also have a long-standing rivalry with Roma, with whom they contest the Derby del Sole. The club's anthem is "'O surdato 'nnammurato". The first club was founded as Naples Foot-Ball & Cricket Club in 1904 by English sailor William Poths and his associate Hector M. Bayon. Neapolitans such as Conforti, Catterina and Amedeo Salsi were also involved, the latter of whom was the club's first president. The original kit of the club was a sky blue and navy blue striped shirt, with black shorts. Naples' first match was a 3–2 win against the English crew of the boat Arabik with goals from William MacPherson, Michele Scafoglio and Léon Chaudoir. Early into its existence, the Italian Football Championship was limited to just northern clubs, so southern clubs competed against sailors or in cups such as Thomas Lipton's Lipton Challenge Cup. In the cup competed between Naples and Palermo FBC Naples won three finals. The foreign contingent at the club broke off in 1912 to form Internazionale Napoli, in time for both club's debut in the Italian Championship of 1912–13. Under the presidency of Giorgio Ascarelli, the club changed its name to Associazione Calcio Napoli on 23 August 1926. After a poor start, with a sole point in an entire championship, Napoli was readmitted to Serie A's forerunner, the Divizione Nazionale, by the Italian Football Federation ("FIGC"), and began to improve thanks in part to Paraguayan-born Attila Sallustro, who was the first fully fledged hero to the fans. He was a capable goal-scorer and eventually set the all-time goal-scoring record for Napoli, which was later surpassed by players like Diego Maradona and Marek Hamšík. Napoli entered the Serie A era under the management of William Garbutt. During Garbutt's six-year stint, the club would be dramatically transformed, frequently finishing in the top half of the table. This included two third-place finishes during the 1932–33 and 1933–34 seasons, with added notables such as Antonio Vojak, Arnaldo Sentimenti and Carlo Buscaglia. However, in the years leading up to World War II, Napoli went into decline, only surviving relegation in 1939–40 by goal average. Napoli lost a closely contested relegation battle at the end of 1942 and were relegated to Serie B. They moved from the Stadio Giorgio Ascarelli to the Stadio Arturo Collana and remained in Serie B until after the war. When play continued, Napoli earned the right to compete in Serie A, but were relegated after two seasons for a bribery scandal. The club bounced back to ensure top flight football at the start of the 1950s. Napoli moved to their new home ground Stadio San Paolo in 1959. Despite erratic league form with highs and lows during this period, including a further relegation and promotion, Napoli had some cup success when they beat SPAL to lift the Coppa Italia in 1962, with goals from Gianni Corelli and Pierluigi Ronzon. Their fourth relegation cut celebrations short the following season. As the club changed their name to Società Sportiva Calcio Napoli on 25 June 1964 they began to rise up again, gaining promotion in 1964–65. Under the management of former player Bruno Pesaola, they won the Coppa delle Alpi and were back among the elite in Serie A, with consistent top-five finishes. Napoli came very close to winning the league in 1967–68, finishing just behind Milan in second place. Some of the most popular players from this period were Dino Zoff, José Altafini, Omar Sívori and hometown midfielder Antonio Juliano. Juliano would eventually break the appearance records, which still stands today. 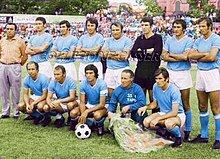 The trend of Napoli performing well in the league continued into the 1970s, with third place spots in 1970–71 and 1973–74. Under the coaching of former player Luís Vinício, this gained them entry into the early UEFA Cup competitions. In 1974–75, they reached the third round knocking out Porto 2–0 en route. During the same season, Napoli finished second in Serie A, just two points behind champions Juventus. Solid performances from locally born players such as Giuseppe Bruscolotti, Antonio Juliano and Salvatore Esposito were relied upon during this period, coupled with goals from Giuseppe Savoldi. After defeating Southampton 4–1 on aggregate to lift the Anglo-Italian League Cup, Napoli were entered into the UEFA Cup Winners' Cup for 1976–77, where they reached the semi-finals, losing 2–1 on aggregate to Anderlecht. The club won their second Coppa Italia trophy in 1975–76, eliminating Milan and Fiorentina en route, before beating rivals Hellas Verona 4–0 in the final. In the Italian league, Napoli were still very much a consistent top six side for much of the late 1970s. Even into the earliest two seasons of the 1980s, the club were performing respectably with a third-place finish in 1980–81. However, by 1983, they had slipped dramatically and were involved in relegation battles. Napoli broke the world transfer record fee after acquiring Diego Maradona in a €12 million deal from Barcelona on 30 June 1984. The squad was gradually re-built, with the likes of Ciro Ferrara, Salvatore Bagni and Fernando De Napoli filling the ranks. The rise up the tables was gradual, by 1985–86, they had a third-place finish under their belts, but better was yet to come. The 1986–87 season was the landmark in Napoli's history; they won the double, securing the Serie A title by three points and then beating Atalanta 4–0 to lift the Coppa Italia. Napoli supporters celebrating the team's first scudetto in May 1987. Because a mainland Southern Italian team had never won the league before, this turned Maradona into a cultural, social and borderline religious icon for Neapolitans, which stretched beyond the realms of just football. The club were unsuccessful in the European Cup in the following season and finished runners-up in Serie A. However, Napoli were entered into the UEFA Cup for 1988–89 and won their first major European title. Juventus, Bayern Munich and PAOK were defeated en route to the final, where Napoli beat VfB Stuttgart 5–4 on aggregate, with two goals from Careca and one each from Maradona, Ferrara and Alemão. Napoli added their second Serie A title in 1989–90, defeating Milan by two points in the title race. However, this was surrounded by less auspicious circumstances as Napoli were awarded two points for a game, when in Bergamo, an Atalanta fan threw a 100 lira coin at Alemão's head. A controversial set of events set off at the 1990 World Cup, when Maradona made comments pertaining to North–South inequality in the country and the risorgimento, asking Neapolitans to root for Argentina in the semi-finals against Italy in Naples. The Stadio San Paolo was the only stadium during the competition where the Argentine national anthem was not jeered, Maradona bowed to the Napoli fans at the end and his country went on to reach the final. However, after the final, the Italian Football Federation (FIGC) forced Maradona to take a doping test, which he failed testing positive for cocaine; both Maradona and Napoli staff later claimed it was a revenge plot for events at the World Cup. Maradona was banned for 15 months and would never play for the club again. The club still won the Supercoppa Italiana that year, with a record 5–1 victory against Juventus, but it would be their last major trophy for 22 years. However, in the European Cup, they were eliminated in the second round. Though the club finished fourth during the 1991–92 season, Napoli gradually went into decline after that season, both financially and on the field. Players such as Gianfranco Zola, Daniel Fonseca, Ciro Ferrara and Careca had all departed by 1994. Nonetheless, Napoli qualified for the 1994–95 UEFA Cup, reaching the third round and in 1996–97, Napoli appeared at the Coppa Italia final, but lost 3–1 to Vicenza. Napoli's league form had dropped lower, and relegation to Serie B came at the end of 1997–98 when they won only two matches all season. The club returned to Serie A after gaining promotion in the 1999–2000 season, though after a closely contested relegation battle, they were relegated immediately back down the following season. By August 2004, Napoli was declared bankrupt. To secure football in the city, film producer Aurelio De Laurentiis refounded the club under the name Napoli Soccer, as they were not allowed to use their old name. FIGC placed Napoli in Serie C1, where they missed out on promotion after losing 2–1 in play-offs to local rivals Avellino in 2004–05. Despite the fact Napoli were playing in a low division, they retained higher average attendances than most of the Serie A clubs, breaking the Serie C attendance record with 51,000 at one match. The following season, they secured promotion to Serie B and De Laurentiis bought back the club's history, restoring its name to Società Sportiva Calcio Napoli in May 2006. After just one season in Serie B, they were promoted to the top division, along with fellow "sleeping giants" Genoa. In 2010, under manager Walter Mazzarri, Napoli finished in sixth place to qualify for a 2010–11 UEFA Europa League spot. Napoli finished third in the 2010–11 season, qualifying directly to the group stage of the 2011–12 UEFA Champions League. In the 2011–12 season, Napoli ended in fifth place in Serie A, but defeated unbeaten champions Juventus in the Stadio Olimpico to win the Coppa Italia for the fourth time in club history, 25 years after their last cup win. The team finished second in its group of the 2011–12 UEFA Champions League, progressing to the round of 16, where they were eliminated by eventual winners Chelsea. In 2012–13, Napoli finished in second place in Serie A, the club's best performance since winning the 1989–90 Scudetto. Cavani finished as top scorer in the division with 29 goals, which resulted in him being sold to Paris Saint-Germain for a club record fee of €64 million. In the 2013 close-season, Mazzarri left Napoli. They finished the season by winning the 2014 Coppa Italia Final, their fifth title in the tournament, with a 3–1 win against Fiorentina, as well as qualifying for the Champions League. In 2017–18, Napoli challenged for the title all season, which went to Juventus in the penultimate round of matches. In the summer of 2000, Napoli retired the jersey number 10 belonged to former club legend Diego Maradona, who played for the club from 1984 to 1991, as a tribute to his class and to the significant contribution made in the seven seasons with the shirt of Napoli. In order, the last players to wear number 10 were Fausto Pizzi (1995–1996), Beto (in 1996–1997), Igor Protti in 1997–1998 was the last player to play and score a goal with the number 10 shirt in Serie A and Claudio Bellucci in 1998–1999 and 1999–2000 in Serie B. However, for regulatory reasons, the number was reissued on blue shirts 2004 to 2006 Serie C1, a tournament where there is the old numbering from 1 to 11. The last player to wear and score goals with this shirt in an official match was Mariano Bogliacino in the home match of 18 May 2006 against Spezia, valid for the final leg of the Supercoppa di Lega Serie C1; primacy belongs to him also for last appearance in the championship, 12 May 2006 at the home match against Lanciano. As regards exclusively the championship, however, the honour goes to the Argentine footballer Roberto Sosa, the distinction of being the last to wear the 10 at the San Paolo and at the same time to score in the match against Frosinone on 30 April 2006. Below is the official presidential history of Napoli, from when Giorgio Ascarelli took over at the club in 1926, until the present day. Marek Hamšík holds Napoli's official appearance record, having made 513, he also holds the record for league appearances with 403 over the course of 11 years from 2007. The all-time leading goalscorer for Napoli is Marek Hamšík with 120 goals. Diego Maradona is the second highest goalscorer with 115 goals: he finished the season of Serie A as the league's topscorer, known in Italy as the capocannoniere, in the 1987–88 season with 15 goals. The record for most goals in the league (also including the Divisione Nazionale tournaments) belongs to Attila Sallustro, with 106 goals, while the highest scorer in Serie A is Antonio Vojak with 102 goals. The record for most goals in a single league season belongs to Gonzalo Higuaín, with 36 in the 2015–16 Serie A. The biggest ever victory recorded by Napoli was 8–1 against Pro Patria, in the 1955–56 season of Serie A. Napoli's heaviest championship defeat came during the 1927–28 season when eventual champions Torino beat them 11–0. As Naples is a coastal city, the colours of the club have always been derived from the blue waters of the Gulf of Naples. Originally, while using the name Naples FBC, the colours of the club implemented two shades of blue. However, since the 1920s, a singular blue tone has been used in the form of azure. Thus, Napoli share the nickname "Azzurri" with the Italy national team. The shade of blue has been sky blue in many instances. One of the nicknames of Napoli is "I ciucci", which means "the donkeys" in the local dialect. Napoli were given this name after a particularly poor performance during the 1926–27 season. It was originally meant to be derogatory, as the Neapolitan symbol is a rampant black horse, but the club adopted the donkey as a mascot named "O Ciuccio". Napoli's club badge features a large "N" placed within a circle. This crest can be traced back to Internazionale Napoli, which used a similar design on their shirts. Since the club officially adopted the "N badge" as its representative, Napoli have altered it slightly at various times; sometimes it features the club's name around it, sometimes it does not. The main difference between each badge is the shade of blue used. Usually the "N" is white, although it has occasionally been gold. "Partenopei" is a popular nickname for the club and people from the city of Naples in general. It is derived from Greek mythology where the siren Parthenope tried to enchant Odysseus from his ship to Capri. In the story, Odysseus had his men tie him to the ship's mast so he was able to resist the song of the siren. Consequently, Parthenope, unable to live with the rejection of her love, drowned herself and her body was washed up upon the shore of Naples. Napoli is the fourth most supported football club in Italy with around 13% of Italian football fans supporting the club. Like other top clubs in the country, Napoli's fanbase goes beyond the Italian border; it has been estimated by the club that there are around 6 million fans worldwide. Unlike other Italian cities such as Genoa, Milan, Rome and Turin, Napoli is the only major football club in the city and therefore there is no derby in the strict sense of the term. Nevertheless, the fans of Napoli do co-star in two particular derbies in Italy against other regional teams: Derby della Campania generally refers to a rivalry with regional clubs, mainly Avellino and Salernitana. 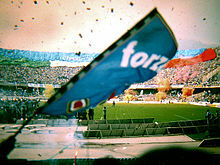 Napoli have a famous and long-standing friendship with the fans of Genoa. It also has a smaller friendship with the fans of Bulgarian club Lokomotiv Plovdiv; Napoli gave birth to the name "Napoletani Ultras Plovdiv", which is how the friendship arose. Other friendships exist with Catania, Palermo, Borussia Dortmund, Paris Saint-Germain, and Celtic. S.S.C. 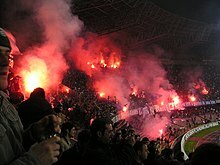 Napoli was expelled from the professional league in 2004. Thanks to Article 52 of N.O.I.F., the sports title was transferred to Napoli Soccer (later the new Napoli) in the same year, while the old Napoli was liquidated. In the second last season before bankruptcy, the club was partially saved by the non-standard accounting practice of amortization after Silvio Berlusconi, owner of Milan and prime minister of Italy, introduced Italian Law 91/1981, Article 18B. Since re-foundation in 2004, the clubs large numbers of supporter provided the main source of income, particularly through gate revenues and TV rights. Napoli made an aggregate profit in 2006–07 Serie B. They have continued to be profitable since returning to Serie A. Napoli equity in 2005 was a negative of €261,466., which the club started from €3 million capital. By 2010 the equity was at €25,107,223 and Napoli achieved self-sustainability. ^ a b c d e f g h i j "La storia del Calcio Napoli sino ai giorni nostri" (in Italian). Ale Napoli. Archived from the original on 24 October 2008. ^ "Storia" (in Italian). Calcio Napoli Net. 26 June 2007. Archived from the original on 9 August 2007. ^ a b "Il tifo calcistico in Italia – Settembre 2012" (in Italian). September 2012. Retrieved 18 September 2012. ^ "Deloitte Football Money League 2014". Deloitte. Retrieved 9 October 2014. '^ Joseph Sciorra, Italian Folk: Vernacular Culture in Italian-American Lives (2010), page 116 "the Neapolitan standard O surdato 'nnammurato (A Soldier in Love)"
^ a b c "Storia Del Club, by Pietro Gentile and Valerio Rossano" (in Italian). Napoli 2000. 23 June 2007. Archived from the original on 2 July 2007. ^ "Willy Garbutt, The Italian Trailblazer". British Council. 23 June 2007. Archived from the original on 30 March 2008. ^ "Dal Naples Football Club all'Internaples" (in Italian). S.S.C. Napoli. 23 June 2007. ^ "Napoli back among the big boys". FIFA.com. Fédération Internationale de Football Association. 3 April 2009. Retrieved 14 January 2019. ^ "I Primi 60 Anni: Dalla Nascita Aalla Coppa Lipton" (in Italian). Cuore Rosanero. 23 June 2007. Archived from the original on 11 October 2007. ^ "La Storia. – Periodo 1904–1926 – La Preistoria" (in Italian). Napolissimo. 26 June 2007. ^ "A short history of Napoli's roots: The Spark of Life". 'O Ciuccio. 24 June 2007. Archived from the original on 11 February 2007. ^ a b c d e f g h i j k l m n o p q Modena, Panini Edizioni (2005). Almanacco Illustrato del Calcio – La Storia 1898–2004. ^ "Storia del Napoli: Gli anni venti e trenta" (in Italian). Vesuvio. 26 June 2007. Archived from the original on 15 July 2012. ^ "Gli anni '30" (in Italian). YouNapoli.com. 26 June 2007. Archived from the original on 4 May 2007. ^ a b c d e "Napoli Player Statistics". ClubAngloNapulitano. Retrieved 14 January 2019. ^ "Storia del Napoli (1904–1960)" (in Italian). Magico Napoli. 26 June 2007. Archived from the original on 7 March 2005. ^ "UEFA Cup Winners' Cup". UEFA. 26 June 2007. Archived from the original on 11 January 2008. ^ "Finals Countdown: Argentina". U4 The Game. 26 June 2007. Archived from the original on 14 October 2007. ^ a b c d "People's champion". Channel 4. 26 June 2007. Archived from the original on 29 May 2008. ^ "European Competitions 1988–89". Rec.Sport.Soccer Statistics Foundation. 26 June 2007. ^ Maradona, Diego (2004). El Diego, pg. 165. ^ "UEFA European Cup Matches 1990–1991". Xs4All. 26 June 2007. ^ "Coppa Italia champions – Names and Numbers; soccer". FindArticles. 24 July 2007. Archived from the original on 27 September 2004. ^ "Napoli declared bankrupt says ANSA". CNN. 24 June 2007. ^ "Luigi e Aurelio De Laurentiis" (PDF) (in Italian). My Movies. 26 June 2007. ^ "De Laurentiis: "Il mio Napoli tra le grandi"" (in Italian). Solo Napoli. 24 June 2007. ^ "Genoa e Napoli ritorno in paradiso" (in Italian). La Repubblica. 10 July 2007. Retrieved 28 July 2009. ^ "Juve, addio alla Champions. Il Napoli vola in Europa" (in Italian). Corriere dello Sport. 2 May 2010. Archived from the original on 29 February 2012. Retrieved 2 May 2009. ^ "The 2010–2011 Serie A table". S.S.C.Napoli. Retrieved 19 July 2011. ^ "Edinson Cavani joins Paris Saint-Germain for French club record fee". The Guardian. 16 July 2013. Retrieved 2 July 2018. ^ "Rafa Benitez Is Napoli Manager". BBC. Retrieved 27 May 2013. ^ "Coppa Italia final: Rafael Benitez's Napoli beat Fiorentina 3–1". BBC Sport. 3 May 2014. Retrieved 3 May 2014. ^ "Juventus secure 7th straight Serie A title; Inter's top-4 hope restored". ESPN FC. 13 May 2018. Retrieved 10 June 2018. ^ Agorà Telematica, Agorà Med S.r.l. "Prima squadra – SSC Napoli". www.sscnapoli.it. ^ "Sosa, sono lacrime di festa". Repubblica.it. 11 May 2008. Retrieved 29 January 2010. ^ "All the presidents from Ascarelli to De Laurentiis". S.S.C. Napoli. 23 June 2007. Retrieved 14 January 2019. ^ "Omaggio al Napoli di Giovanni Armillotta" (in Italian). Gloria Eterna Al Napoli. 24 June 2007. Archived from the original on 26 October 2009. ^ "Italy – Serie A top scorers". Rec.Sport.Soccer Statistics Foundation. Archived from the original on 31 October 2015. Retrieved 14 January 2019. ^ "Napoli's Gonzalo Higuain sets Serie A goals record with 36 in a season". ESPN FC. 14 May 2016. Retrieved 2 July 2018. ^ "Gonzalo Higuain's £75m Juventus move – its place in history and what it means for football". eurosport.com. 26 July 2016. Retrieved 26 July 2016. ^ "Napoli Calcio" (in Italian). Agenda Online. 24 June 2007. ^ "La Storia – Periodo 1904–1926" (in Italian). Napolissimo. 23 June 2007. Archived from the original on 24 July 2012. ^ "What's in a Nickname? The Answer Is in the Cup". NPR. 24 June 2007. ^ "Stemma Provincia di Napoli" (in Italian). Comuni-Italiani. 24 June 2007. ^ "A short history of Napoli's roots". 'O Ciuccio. 24 June 2007. Archived from the original on 11 February 2007. ^ "Napoli Story". Riccardo Cassero. 24 June 2007. ^ "Napoli Information". WeltFussballarchiv. 24 June 2007. ^ "Napoli Information". WeltFussballarchiv. 24 June 2007. Archived from the original on 28 September 2007. ^ "The Story of La Partenope". La Partenope. 24 June 2007. Archived from the original on 28 September 2007. Retrieved 25 August 2007. ^ "Center of Naples, Italy". Chadab Napoli. 24 June 2007. Archived from the original on 5 October 2011. ^ "I colori del Napoli". riccardocassero.it. 18 February 2010. Retrieved 14 January 2019. ^ "Napoli History". Napoli AZplayers. 29 June 2007. Archived from the original on 28 July 2007. ^ "Yaya Tourè: "Al San Paolo mi tremavano le gambe, dopo l'inno capii in che guaio ci eravamo messi..."". Tutto Napoli. 28 November 2006. Retrieved 31 March 2014. ^ "Genoa and Napoli". Forum of S.S.C. Napoli official site. 29 June 2007. Archived from the original on 11 September 2007. ^ "Unlikely friendships between rival Italian clubs". WSC.co.uk. 2011-11-08. Retrieved 2018-07-25. ^ "Napoletani Ultras Plovdiv (Lokomotiv Plovdiv-Bulgaria)". Ultras-tifo.net. 2008-01-05. Retrieved 2016-04-05. ^ "Gemellaggio Napoli Palermo". Tuttocurve (in Italian). 2015-10-29. Retrieved 2018-12-22. ^ "Napoli, gemellaggio coi tifosi del Borussia Dortmund". www.calciomercato.it (in Italian). Retrieved 2018-12-22. ^ "Napoli-Psg, il gemellaggio ultrà: l'abbraccio nel nome di Maradona". sport.ilmattino.it (in Italian). Retrieved 2018-12-22. ^ IamNaples.it, Redazione (2016-02-25). "FOTO – Continua il gemellaggio tra Napoli e Celtic Glasgow". www.iamnaples.it (in Italian). Retrieved 2018-12-22. ^ a b S.S.C. Napoli S.p.A. bilancio (financial report and accounts) on 30 June 2003 (in Italian), PDF purchased from Italian C.C.I.A.A. ^ a b S.S.C. Napoli S.p.A. bilancio (financial report and accounts) on 30 June 2007 (in Italian), PDF purchased from Italian C.C.I.A.A. ^ a b S.S.C. Napoli S.p.A. bilancio (financial report and accounts) on 30 June 2008 (in Italian), PDF purchased from Italian C.C.I.A.A. ^ a b S.S.C. Napoli S.p.A. bilancio (financial report and accounts) on 30 June 2001 (in Italian), PDF purchased from Italian C.C.I.A.A. ^ "Norme in materia di rapporti tra società e sportivi professionisti – Altalex". Altalex (in Italian). Retrieved 14 January 2019. ^ S.S.C. Napoli S.p.A. bilancio (financial report and accounts) on 30 June 2002 (in Italian), PDF purchased from Italian C.C.I.A.A. ^ Napoli Soccer S.p.A. bilancio (financial report and accounts) on 30 June 2005 (in Italian), PDF purchased from Italian C.C.I.A.A. ^ S.S.C. Napoli S.p.A. bilancio (financial report and accounts) on 30 June 2006 (in Italian), PDF purchased from Italian C.C.I.A.A. ^ S.S.C. Napoli S.p.A. bilancio (financial report and accounts) on 30 June 2009 (in Italian), PDF purchased from Italian C.C.I.A.A. ^ S.S.C. Napoli S.p.A. bilancio (financial report and accounts) on 30 June 2010 (in Italian), PDF purchased from Italian C.C.I.A.A. Wikimedia Commons has media related to S.S.C. Napoli.